As our product range of metal solutions has developed into multi metals we have adapted our range of fixings to suit. Now we can supply metal jacketing and cladding manufactured in Aluminium but we are conscious that our customers often want a one stop shop for all requirements. So for export projects we can deliver the whole requirements to site with one set of docum­en­ta­tion, on time and to the highest quality. Our bulk manufacturing allows us to offer more products to specific markets like fixings including aluminium banding and wing seals for holding metal in place without the need to pierce the metal, these are complimented by aluminium toggle and latches, and a huge range of aluminium rivets. Standard blind rivets are one of the most widely used rivet for the sheet metal industry, typically the rivet body is manufactured from Aluminium and the Mandrel from steel. These rivets are sometimes referred to by the description "pop" rivet this is similar to the sound made when a blind rivet is installed. Dependent on the size and type of rivet these can be fixed using a hand riveter or an automatic rivet gun. Two important factors to get right are the hole size which needs to be large enough but not too big. Secondly the grip range when joining two pieces of metal together you need to ensure the grip range is high enough to cover the thickness otherwise the rivet and joint will fail. Full details of our rivet sizes, specifi­cations and grip range are available to help. 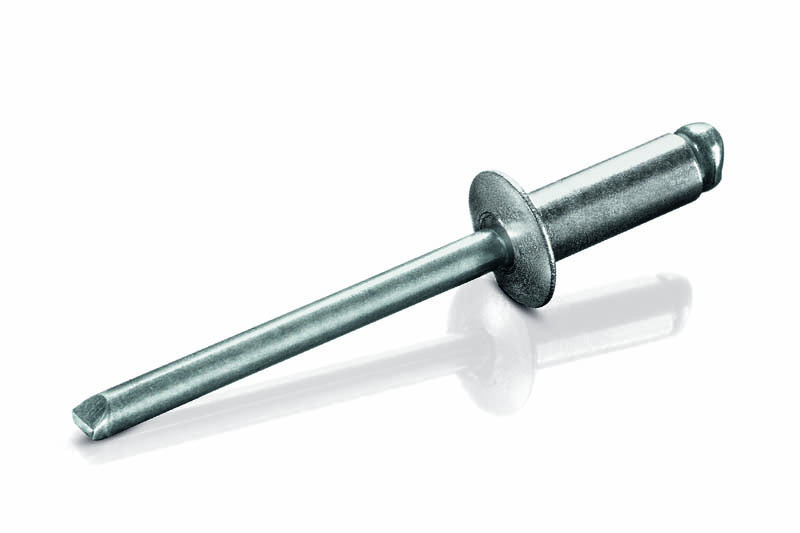 Although standard blind rivets are the most popular aluminium rivet used for sheet metal work such as ducting and joining of metal panels a wide range of variations are available to suit multiple industries and materials. Multi grip rivets are widely used for air conditioning and the furniture industry, cup rivets are often used to get a tight waterproof seal ideal for ships, tanks and construction. Aluminium rivets are not just used for metal though they can be used for plastic and wood so popular for furniture, car interiors and plastic cladding. Lastly if as Aluminium is often used in a variety of colours for trailers, caravans and cladding rivets can be done to match in fact pretty much any colour of the rainbow. These sometimes have to be made to order but common ones like white, black, green and gold are readily available. So if you need a strong light weight easy to use fixing then think Aluminium rivets, they will last for a long time but are also 100% recyclable. If you need advice, availability, rivet guns or drill bits to suit we can supply the full solution. You can find out more details of our Aluminium rivets, along with dteails of other rivets including stainless steel and zinc coated rivets or Galvanized rivets. You can email enquiries to sales@bsstainless.com, telephone us on +44 (0) 1772 33755 or even buy online from BS Fixings.